We are proud to be a part of the Hendersonville community and to share our passion for craft beer. Dry Falls Brewing Co. started out as a dream between father and son while sitting in a brewery on family vacation. 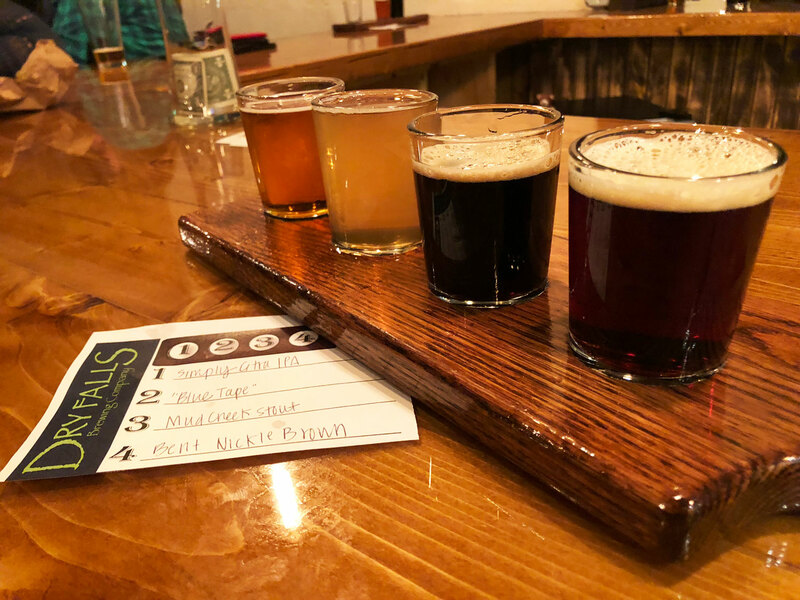 Romanticizing the idea while drinking a flight of twenty-four different brews, Jeff and Evan found their next father/son hobby. Jeff took to idea first brewing extract kit beers with a co-worker. After the first brew day, Jeff was hooked. He called his son and they talked at great length about starting to brew as a hobby. They dove into books on brewing and purchased homebrewing equipment. They decided to brew full grain, just like the pros! 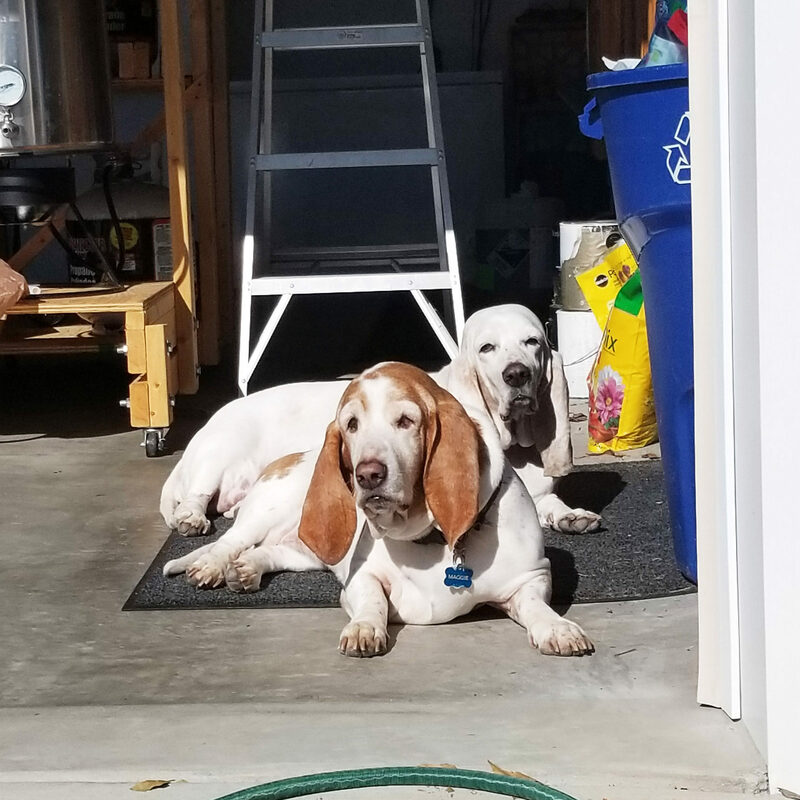 Over a six-month period, they built a small working brewery inside Jeff’s garage. Jeff built a kegerator out of an old refrigerator and turned a chest freezer into a climate controlled area to house fermenters. They started out brewing every three weeks, mostly just to have craft beer on tap at home. Friends, family, and neighbors started coming over and sharing pints. After hosting a tasting party, Jeff and Evan revisited the idea that sent them down this path; to open their own brewery. In 2015 Evan’s mother finally pushed her boys in the direction they needed. 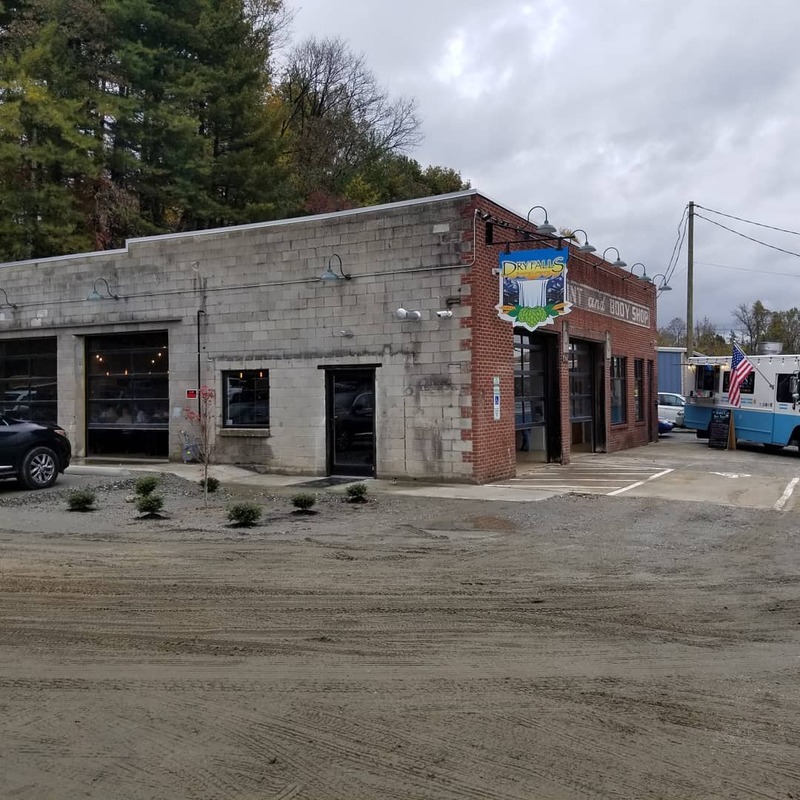 She gave the ultimatum “Do it, or stop talking about it.” In August 2016, Dry Falls Brewing Co. was founded and later purchased the Kanuga Rd location. They saw the old body shop for what is could be; a great place for a brewery. Prost! We have awesome Music Lined up this Easter Weekend!! Tonight is our Safelight Easter Charity Event! We want to make Easter a little bit brighter for children in the Safelight Shelter. We are asking for Chocolate Easter Eggs, Toys or anything Easter related that a child might love. In return you will receive a $10 gift card from Dry Falls Brewing. The Oates Paint and Body Shop has been a landmark at the Busy Bend for over 70 years. 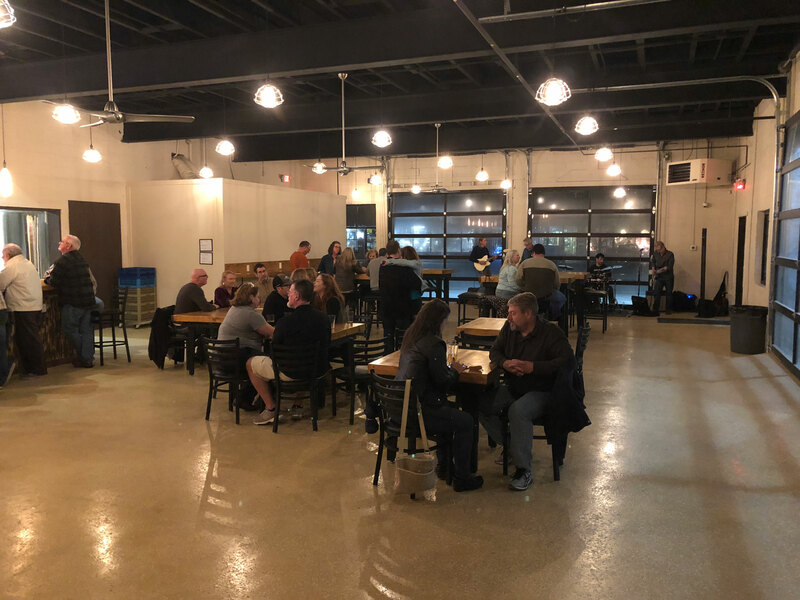 When the Hendersonville community found out it was going to being renovated and turned into a brewery, everyone who stopped by shared stories about how they or a relative had previously had a car fixed at Oates. This started the year long restoration project to breathe new life into the building. The walls were stripped, garage doors torn down, and the roof was moved away. All that was left of the roof was a small pile of wood that would be repurposed into a barn door. The paint store next door was removed to make way for a new parking lot. The new roof went up and things were moving right along, and then the first bump in the rocky road hit. While cutting the trenches out of the old concrete floors, they found the water table and the building flooded. Then heavy rains belted down over the next weeks. After reengineering a drainage system and getting dried out, things picked up until construction began on the backside of the building. A large rock, roughly the size of a tank, brought construction to a stop for six weeks. This rock was later renamed “Mt. Delay” in a text message to Jeff from Evan. As the family laughed off this delay, a new beer name was also created. As the brew system arrived, the dream was becoming a reality. A long road ahead remained. The brewhouse was finished with first and brewing was about to begin. Then the next big delay happened. A desire to preserve the original look inside the building; Jeff and Evan wanted a clear epoxy over the original concrete floors, but the old concrete turned orange when the epoxy was put down. It took two weeks to grind up the epoxy and redo the floor was different epoxy. Construction on the taproom resumed and brewing could officially begin. Brewing started at the end of August, construction on the taproom and the parking lot were completed six weeks later in October. On a raining afternoon during the first weekend in November, the family dream of Dry Falls Brewing Co. finally came true. We’re constantly hosting events at the brewery. Follow along on our Facebook event page to see what’s going on next! Live performances by Raphael, Tang Live, Bill Altman, Rev. Hylton, Brief Awakening, and more! Website Designed By: Arrowhead Design Co.